Redmi Note 7 Pro Launching on March 18 in China; Limited Edition Also Coming - Playfuldroid! Through Weibo, Redmi has confirmed that it will be launching the Redmi Note 7 Pro will be launching in China on March 18. The launch event will begin on the said date at 2 PM. Lu Weibing who is the Redmi President has confirmed that there is a limited-edition signature version of the smartphone. The Redmi Note 7 Pro was announced yesterday in India. The 6 GB RAM + 128 GB storage and 4 GB RAM + 64 GB storage version of the phone were respectively introduced for Rs. 16,999 ($239) and Rs. 13,999 (~$199). There is no information available on the price tag of the phone for the Chinese market. Also, the smartphone is expected to come with China-exclusive features. 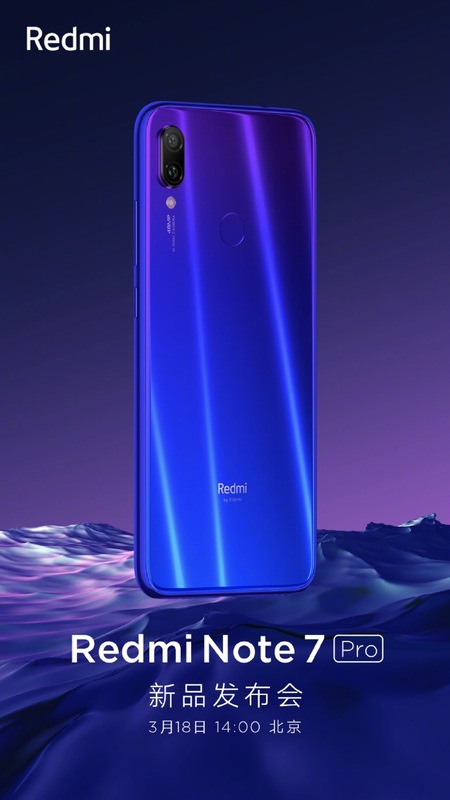 The Redmi Note 7 Pro that comes with a glass rear with gradient finish is fitted with a 6.3-inch IPS LCD display with waterdrop notch. The display produces full HD+ resolution and 19.5:9 aspect ratio. The Snapdragon 675 chipset powers the smartphone. For photography, the handset has a dual camera setup that has a 48-megapixel Sony IM586 primary sensor and a 5-megapixel depth sensor. There is a selfie camera of 13-megapixel. The handset includes 4,000mAh battery that carries support for 18W fast charging. The other features of the phone include Android 9 Pie, microSD card and fingerprint scanner.